How does one rise on Easter morning with words to express accurately the significance of this day? I confess such an inadequacy. My heart was stirred last evening while attending “The Living Gallery” at Bob Jones University. The painting of Christ being taken down from the cross renewed within me a sense of the pain and loss my Savior endured. Watching that painting brought to life caused me to see my sin in a new light, for it was my sin that made his sacrifice a requirement of a Holy God. This is not the first time I have experienced such a vivid recreation, and I pray we who know the salvation found only in Christ will never, ever forget the magnitude of his death. I know that shortly I will hear a penetrating message on the significance of the cross, but the significance of the cross should stir my heart every day. Since the fall of man, nothing but the cross has altered the course of humanity so dramatically, and nothing stirs such passion within the souls of men than the cross. As much as the cross divides, it unites. It is not a piece of wood in the shape of a cross that is significant. It is what happend on that cross that is a Christian’s reality. I have written before how important music is in my worship. There is a relatively new song by Keith Getty and Stewart Townsend that stirs my heart each time we sing it, and the words resound for days afterwards. We sang it Friday night in a special Good Friday service at church, and I want to share the words to “The Power of the Cross” with you. 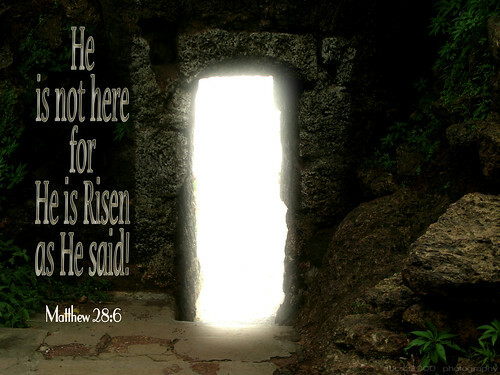 The tomb is empty! Christ is risen! Hallelujah! The Lord be praised!